My newest smoothie creation is made up of unsweetened hemp milk, beet’s and blueberries. Of course I add my favorite protein powder, Vegan Complete which has 15 grams of protein along with fiber. Beetroot is a rich source of phytochemical compounds that includes ascorbic acid, carotenoids, phenolic acids and flavonoids. 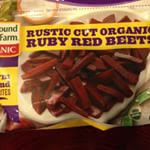 Beetroot is also one of the few vegetables that contain a group of highly bioactive pigments known as betalains. A number of investigations have reported betalains to have high antioxidant and anti-inflammatory capabilities. This has sparked interest in a possible role for beetroot in clinical pathologies characterized by oxidative stress and chronic inflammation such as liver disease. We all know that blueberries are a rich source of antioxidant and 1 cup has 8 grams of fiber! Put in blender and blend until smooth and creamy! Enjoy! 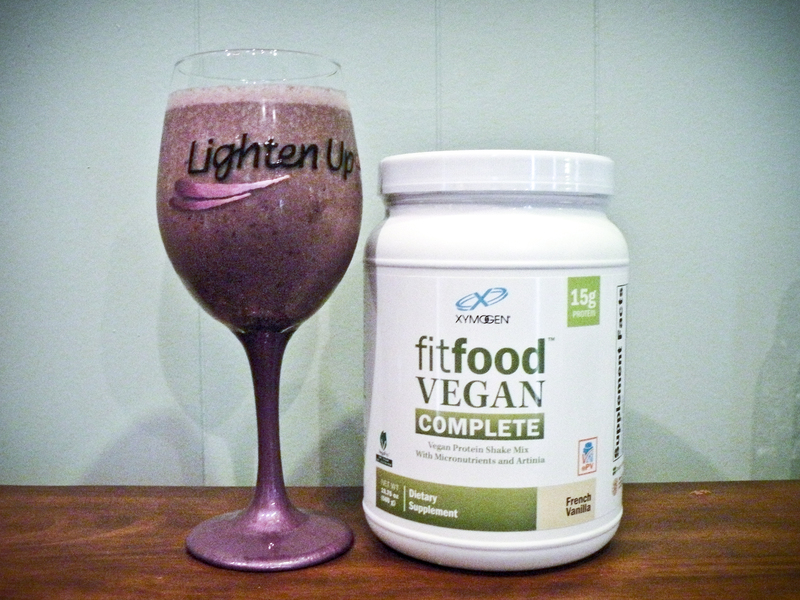 If you mention you saw this blog post receive 10% off on a canister of Vegan Complete! Tina’s Cardiometabolic Protein Smoothie, and a Sale! It’s the time of year where you want something quick, refreshing and satisfying. I combined dark cherries with Fit Food Complete and coconut milk with a added boost of quercetin to help with seasonal allergies. Why call it Cardiometabolic? It has the perfect balance of protein, carbohydrate and fat along with fiber to help stabilize the blood sugar and to make it heart healthy! Quercetin became a popular and widely used remedy for sinus congestion, sneezing, and the pollen season. I have been using it daily and so far sneezing, nasal congestion and headaches have been low! For the next two weeks (April 23rd-May 6th) we will be offering 10% off of Fit Food Complete. When you come into the office or call please mention it and we will gladly apply the discount! Add coconut milk with 1/2 cup water to your blender. Add 1 cup fresh spinach and the quercetin and blend on high. Add protein powder and cherries and blend until you have a creamy smoothie. Today Tina caught wind of a deliciously amazing option at Panera: their Super Top Secret Must-Know-The-Password-To-Order Menu. Okay, it’s not that secret, but somehow it had slipped under our radar. How could Panera, right around the corner from our office, have such a divine bunch of lunch options that we haven’t even heard of?! 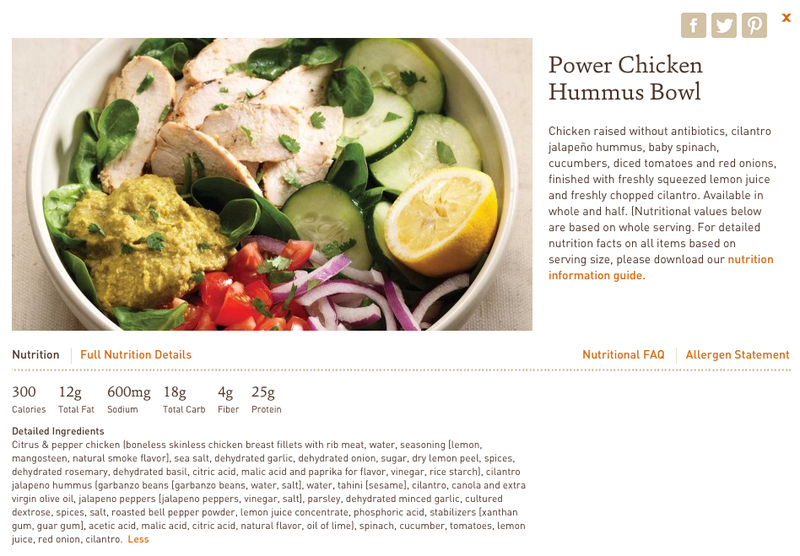 You can check this menu out in its entirety here, but we’re most excited about their Power Chicken Hummus Bowl. Seriously, this salad is amazing. It’s about the farthest thing it could be from a wimpy salad for a wimpy meal plan. 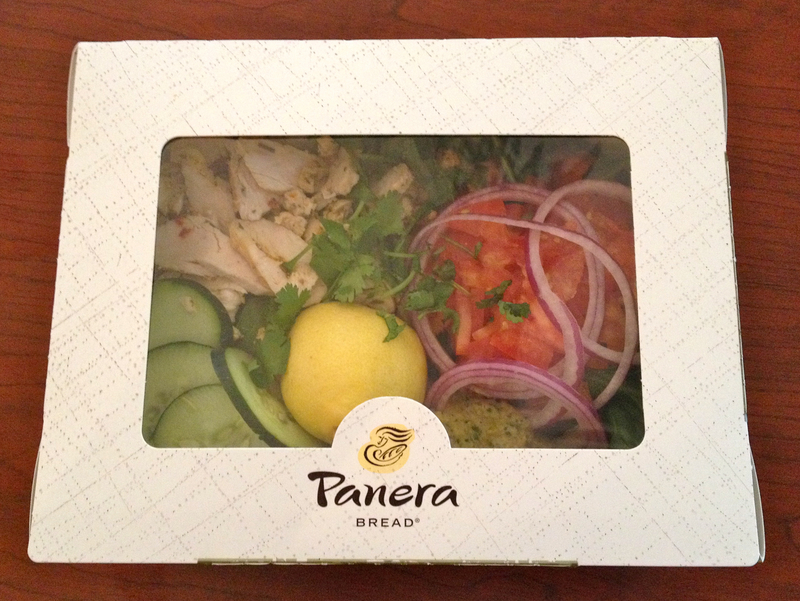 The nice folks at our Panera location whipped this salad up in a flash and sent us on our way with the perfect lunch. It’s convenient and tasty, but what really caught Tina’s eye were the nutrition facts. Here it is in all its well-balanced and nutritious glory. The Registered Dietitian Stamp of Approval is owed to the fact that this salad has a very near perfect balance of nutritional elements for lunch. The ratio here is 18 grams carbs : 4 grams fiber : 25 grams protein. When grabbing lunch out on the run, it’s very important to check that your meal comes as close to this equation as possible. Most restaurant meals, Tina says, push an overload of carbs, throwing your meal our of proportion. Sticking to the figures above will ensure stabilization of blood sugar, allowing for energy levels to remain constant and for focus to increase after your meal; not to mention, keeping you sustained for a good three to four hours. You won’t be snoozing at your desk after this salad. The chicken is antibiotic-free and plentiful, accounting for the generous amount of protein. Hummus is a cleverly added low glycemic index carb, while the flavor and consistency of it (AMAZING) eases one’s desire for creamy dressing. Plenty of veggies and spinach contribute fiber and antioxidant nutrients. Panera’s Power Chicken Hummus Bowl gets an A++ rating on Tina’s list. It’s the best choice we’ve seen in a long, long time from a restaurant. Way to go, Panera. Way to go. The local grocery stores in Richmond and across the country currently feature a healthy array of squash and pumpkins in myriad shapes, sizes and colors. What inspiration for the healthy chef! This month, we are focusing in on different kinds of squash and the recipes that we think complement them best, allowing our readers (and cook-along-at-home-ers) to enjoy the taste and color of the fall season. This week enjoy a pumpkin variety that is usually used in pie, but turns out to be delightful in a savory and spicy soup. Pumpkin is full of nutrients including potassium pantothenic acid, magnesium, vitamin C and Vitamin E; and let’s not forget fiber! Head of time, prepare pumpkin seeds by spreading them out on a pan and allowing them to completely dry. Add coconut oil to a saute pan and place over medium heat. Add pumpkin seeds and allow to toast. Add olive oil to a soup pan and place over medium heat. Add broccoli, cauliflower, onion, garlic and zucchini to the olive oil and continue to cook until soft. Add the chicken stock. In a blender add 1/2 of the pumpkin and the vegetables along with the stock and puree. (I leave some of the vegetables in the soup pan to add texture). Add the cubed pumpkin and season with dried jalapeño. 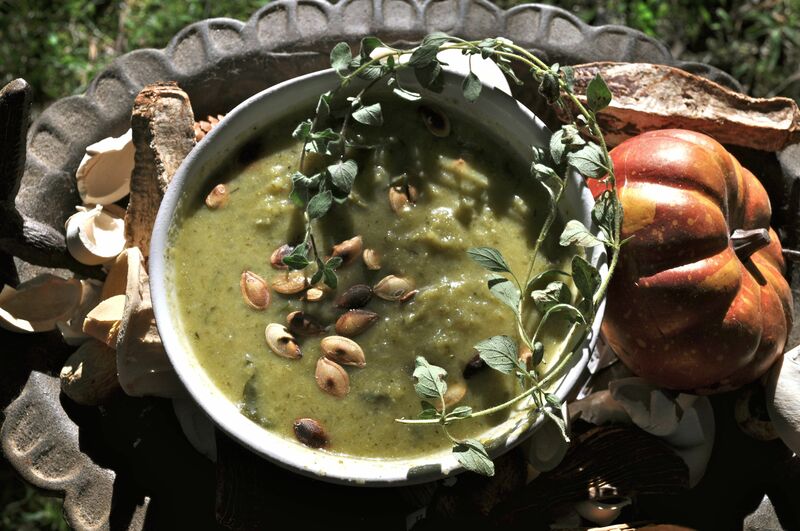 Top the soup with the pumpkin seeds and if dairy is okay for your diet add a dollop of greek yogurt or use coconut cream.